Hardcover with jacket, 560 pages, 15.0 x 22.7 cm, 5.9 x 8.9 in. The Treaty of Versailles has left its mark on the world until today – old empires disappeared, modern national states came into being; new conflicts flared up, on the Balkans or in the Middle East. Yet in 1919 the entire world was longing for a stable order after the Great War and hopes were pinned on permanent peace. 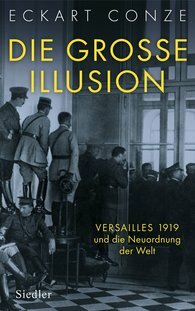 As, however, Eckart Conze demonstrates in his brilliantly written and meticulously researched book, all the expectations turned out to be one gigantic illusion: neither the victorious Allies nor the defeated Germans and the other losers were really prepared to make peace. Even after the ceasefire the war continued in the heads of all those involved, with disastrous consequences. Versailles – that was the peace that no one wanted. For all readers of Christopher Clark's The Sleepwalkers.